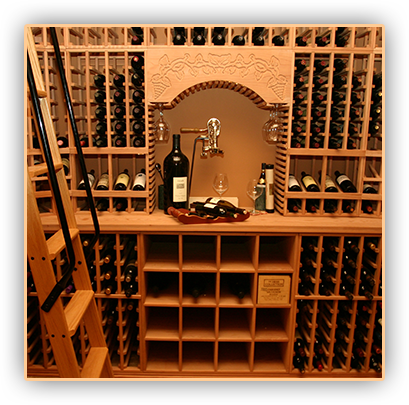 Custom residential wine cellars Naperville Illinois are a spectacular addition to any modern home design scheme. A fully functional wine cellar space is designed to fulfill the storage and management requirements of clients, as well as create a stunning storage layout for showcasing different selections of wine collectibles. Home wine cellars Chicago Illinois not only provides the best environment for cellaring wines, but also space for wine lovers to expand their wine collection over time. 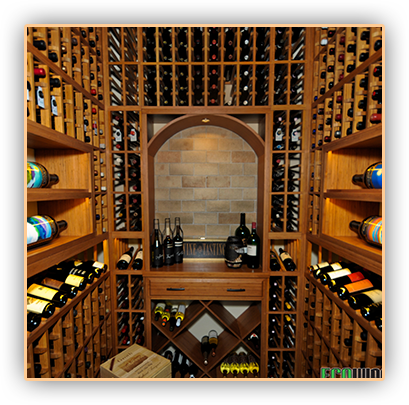 In order for a residential wine cellars Naperville Illinois to be efficient, it must be equipped with the following key components: insulation, a vapor barrier, a proper wine cellar cooling system, and exterior grade wine cellar doors. These elements are essential to maintaining the ideal climate conditions for preserving the taste and flavor of wine for years to come. Whether it is a kitchen extension, or a small closet or garage conversion, a residential wine cellar is an eye-catching home feature that can improve the aesthetics of and enhance the value of any property. This Naperville home wine cellars Chicago Illinois project shows how a small unused space can be converted into an elegant custom wine room with total storage capacity of 497 wine bottles. At 3.5’ by 7.75,’ the design team combined different styles of wine storage and display racks to maximize the limited space. The choice of racking systems were carefully selected, since the designers wanted to achieve the optimum storage capacity, as well as create a visually enticing wine bottle presentation that could be seen through glass windows. 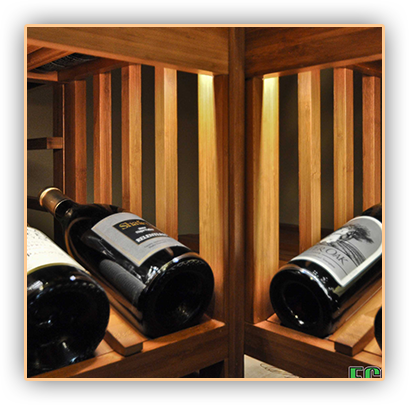 All custom wine racks are made out of unfinished premium redwood. The back wall of the residential wine cellars Naperville Illinois project features a tabletop for serving and decanting wines, and a stemware rack for hanging wine glasses or stemware. The tabletop area is surrounded by single bottle storage racks and a high reveal display row. The display rack with a high reveal feature is also featured on the left side and the right side wall of the storage space. A high reveal display row pitches wine bottles to a 15 degree angle, allowing full visibility of the wine labels. An LED lighting system installed within the display area highlights the labels in a dramatic way. Down below the tabletop area are several openings to accommodate wood case storage. 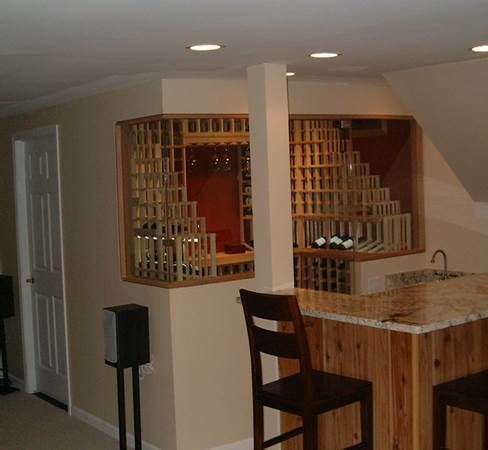 Waterfall wine racking was installed on both ends of the storage space, which creates an interesting and unique look within the Naperville home wine cellars Chicago Illinois. To maintain proper storage conditions, the design team installed a WhisperKOOL XLT 3000 wine cellar cooling system. The refrigeration equipment was placed on the top left wall, and vents warm air to a well-ventilated adjacent room. The wine cellar cooling unit features a PDT thermostat upgrade that prevents frost build-up and provides accurate temperature readout. The entrance to the wine room was constructed from glass. 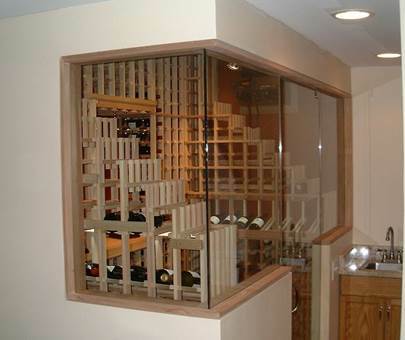 Glass wine cellar doors are a nice fit to a contemporary-themed custom wine cellar space. 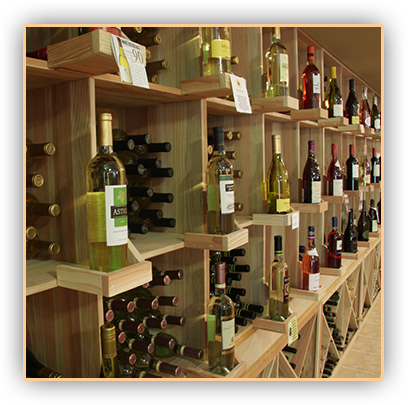 They show off the tastefully designed wine racking systems and exhibit the different wine bottles that are on display. 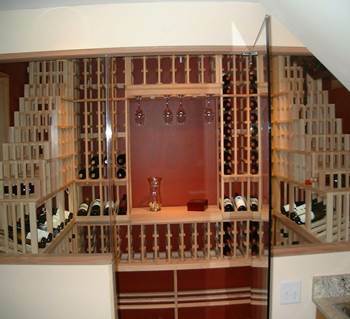 Wine cellar doors constructed from glass have lasting appeal that can amplify the overall design of the storage space.